Jonathan Blaustein's, "The Value of a Dollar Project", not only looked a food in terms of a dollar's worth, but the role of commercial photography in selling food. When Jonathan Blaustein bought 10 early-season organic blueberries for $1, he was a little upset by the price tag. It wasn’t the visual contrast — one dime to one blueberry — that perturbed him. It was the fact that six weeks earlier, he had purchased 17 organic blueberries from Chile for the same price. Maybe it's because Mr. Blaustein is originally from New Jersey, where you buy blueberries by the quart, not the berry. The photographs in this project attempt to strip back the artifice; to depict food items as they were sold, (minus packaging,) without styling, retouching, or artificial lighting. 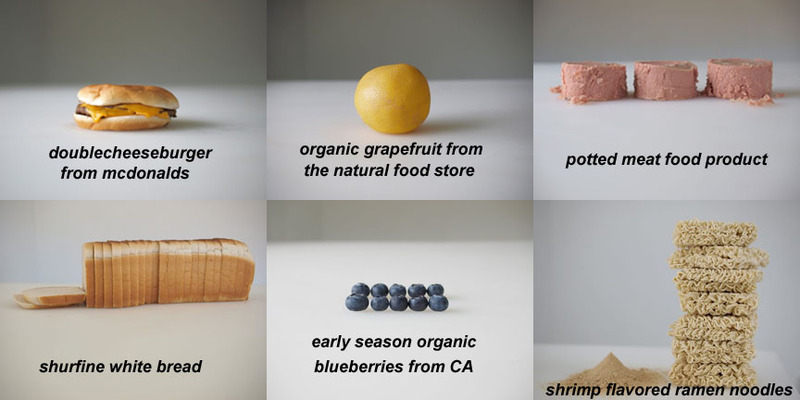 Each image represents a dollar’s worth of food purchased from various markets in New Mexico. The subjects exist as equivalent amounts of commodity, and nothing more. The resulting images allow for a meditation on the power and seductive nature of the photographic medium itself. You can't see it, but, I'm rolling my eyes right now. Good grief. Potted meat is good for camping. The best part of camping is going home. Is it wrong that the things I liked the look of, best... the things that really made my stomach demand sustenance... were the Double CheeseBurger, and Potted Meat? They look... delicious. Closely followed by the noodles - everyone loves Ramen Noodles! "O' Captain! My Captain! Our fearful trip is done;"
"The ship has weather’d every rack, the prize we sought is won;" - Walt Whitman / Leaves Of Grass. That's why I camp at Holiday Inn Express. The best $1 meal, then, is pork floss and beef shank shavings over saffron rice with a shaving of fenugreek, with a side of a conventional grapefruit. Eggs on toast with home fries and baked beans. There I think that's a dollar. What the crap is pork floss? "NTAA - No Taste At All." It's like the green tea of food. Smelt and escargo in a tomatillo sauce over saffron rice. When a ghetto booty has a thong up in between two christmas hams?